Reverse Osmosis Water Filters are one of the most effective forms of water purification available today but they do have some serious drawbacks. They remove virtually all dissolved mater that may be present in the water leaving it just pure H2O. It is very close to distilled water. Reverse Osmosis Water Filters were developed back in the nineteen fifties by the U.S. government as a way to desalinate water. It worked great for the Navy when men were out to sea for long periods of time. They had fresh water on demand at all times without having to store water on board. 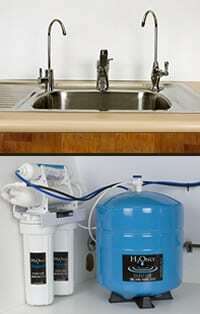 The water purification industry saw an opportunity and started developing reverse osmosis water filters for home use. They have become a very popular and effective way to deliver good clean pure drinking water to homes for many years. They are virtually fail-safe as long a regular maintenance schedule is followed. The heart of reverse osmosis water filters is the membrane. The raw tap water is forced through this membrane and in the process 99.9% of most contaminates is removed. We’re talking highly toxic chemicals like lead, mercury, asbestos, and nitrates. It will also remove hundreds of other toxins that are showing up in municipal drinking water systems. usually have more than a membrane to filter the water. In most cases they will have a sediment pre-filter to take out the larger particles like sand and silt. There is also a carbon pre-filter to remove the chlorine, which will damage a TFC reverse osmosis membrane. A lot of times there will also be a post filter that is a carbon block filter. This polishes the water to give it a very refreshing clean taste. Depending on the type of membrane, reverse osmosis water filters can produce from five up to one hundred gallons of pure water a day for your home. Anything larger than this would be quite costly. Since water has to continually flush the membrane when the pure water is being produced there is a large amount of waste-water going down the drain every time the holding tank needs to be refilled . produces a limited amount of water per day the water is stored in a pressurized tank, which is usually about three to four gallons in size. You will have a separate faucet at your sink to dispense the filtered water. They fit nicely under your sink or you can put them in a remote location like a basement of crawl space if you need to. They are very easy to install. Having a whole house reverse osmosis water filter would be very costly, take up a lot of room in your home, and waste a large amount of water. So they are mainly used for cooking and drinking water. produce water that is acidic. This is a huge drawback of this type of purification system. Since all of the minerals are removed from the water there is nothing to buffer the water and make it either neutral or akaline. Acidic water consumed on a regular basis is not good for your health. The minerals that have been removed need to replaced so they are leached from your body to create the balance. If you are using reverse osmosis water filters it is imperative that you add minerals before you consume the water. You can purchase liquid minerals to accomplish this. Click Image to learn more or Buy. This is not an Aquasana product. Please do not call the 866 number for more information. to learn more about one of the best Reverse Osmosis water filters available on the market today. It remineralizes the water, has a computer to monitor your water quality at all times, and removes 1000’s of contaminants from you drinking water. These reverse osmosis water filters are recommended in areas known to have hard to remove contaminants such as percolate, fluoride, and arsenic.